This little room illustrates the principle of simple elegance, one of the most desirable traits of any country house. While each element is rather humble, the thoughtful combination of materials, colors, shapes, textures, patina, and light create a perfectly tuned harmony of delight. In what would have been a closet, we reclaimed space for a powder room and although it’s quite small, the high ceilings and large window help to impart a sense of spaciousness. 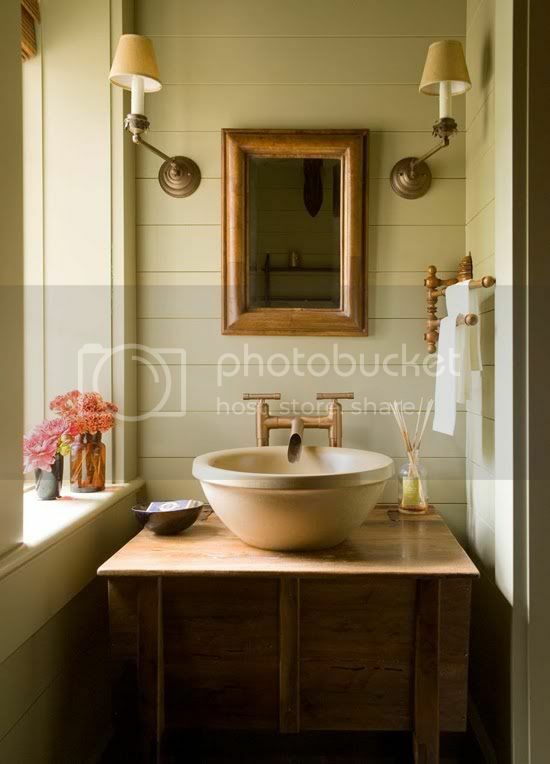 The washstand, a custom piece based on a regional antique and constructed from reclaimed walnut, is a perfect complement to the earthenware bowl and rustic copper spout. Antique accessories provide everything the guest could need, and the red flowers in the windowsill provide a needed burst of color and the perfect finishing touch. photo courtesy of Studio for Civil Architecture, featuring design by Nathaniel Brooks and decor by Suzanne Rester Watson. The post Simply Elegant appeared first on Le Papier Blog.